Captain Wilberforce (Simon Bristoll) is back after a six year hiatus. Chock full of great melodies, ample hooks and compelling lyrics, Captain Wilberforce Black Sky Thinking is a wonder to hear, particularly for those who are predisposed to pop in the vein of the Finn brothers. This becomes immediately apparent on the opening track, a psyche-pop meets Crowded House number called “The Johnnie Depp Memorial Café’”. Easy, smooth harmonies juxtapose rolling thunder guitars, making “Good Times You Said” feel like a smack in the face that leaves a mark (but we secretly enjoy). “You Can’t Have Me” is a beautiful acoustic piece with a great piano accompaniment. You’ll immediately hear the Squeeze influence on “Everybody’s Talking To Themselves”, a quirky little masterpiece and probably my favorite track on the LP. While the melodies are light and uplifting on much of the disk, the mood from a lyrical perspective is a good bit darker. Case in point; “Someone To Love”, a story about a women pondering her overdue exit from a dysfunctional relationship. Similar can be said for the final song and title track. Captain Wilberforce are: Simon Bristoll (vocals/guitars) are Carl Banks (drums), Rob Simpson (guitars) and Massimiliano Borghesi (bass/vocals). 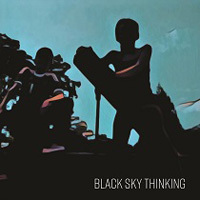 Captain Wilberforce Black Sky Thinking is a highly enjoyable new release and is available now Through Kool Kat Musik.